This Project Online Furniture Shop has been developed on PHP and MySQL. 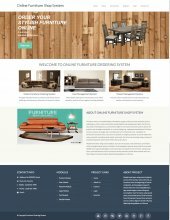 The main aim of this project on Online Furniture Shop Project in Php is to manage the details of Customers, Furniture, Order etc. There are two types of user in this project first one is admin, second one is customer. Admin can manage category, customer, furniture, order, system user etc. Customer can manage their orders, order receipt, payment, item cart etc. Here you can free download php projects, the project including final year academic application and also get php projects free download.